A sheep from a flock established and maintained to be free of MCF and OPP viruses. Animal disease research sometimes follows a predictable path of discovery, identification, test availability, and finally, prevention or cure. But other times, the path becomes a long and winding road. ARS scientists at the Animal Diseases Research Unit (ADRU) in Pullman, Washington, are working to put together the pieces of some tough-to-solve animal disease puzzles. Malignant catarrhal fever (MCF)—a viral infection that is a leading cause of disease in American bison—is usually transmitted from sheep to bison and cattle. Vaccine development has been stymied because the virus will not grow in cell culture. 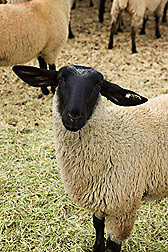 Veterinary microbiologist Hong Li selects MCF virus-free sheep for a viral replication study. The viral replication cycle in sheep can be divided into three stages: entry, maintenance, and shedding. When entering sheep through the nasal route, the virus reaches the lung, where it replicates exclusively. Replication in sheep lung is required for the virus to change its cell tropism for the next stage—infecting lymphocytes, a type of immune cell. In this maintenance stage, the virus stays in the lymphocytes, circulating through the whole body with little replication. This type of infection is referred to as a “latent infection.” During the shedding stage, the virus reactivates from the infected lymphocytes, targets specific cells in the nasal turbinates to complete its replication, and is then shed through sheep nasal secretions. “Amazingly, the virus replicated in turbinate cells is not capable of reinfecting turbinate cells because it changes its cell tropism again,” Li says. This type of presto-chango trickery has been very effective at keeping the virus in circulation. “It also explains why it has been impossible to grow in cell culture—it’s like trying to grow one organism in a cell culture designed for another organism,” Li says. With the knowledge of how the virus replicates in sheep, scientists can now begin to find the right cell types to grow the virus in cell culture. 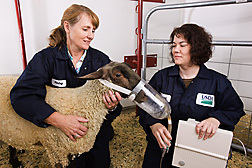 Technician Shirley Elias (left) and veterinary medical officer Naomi Taus use a nebulizer to infect a sheep with MCF virus. Until such a culture becomes available, Li and his colleagues are exploring alternative avenues of developing a vaccine to protect bison and cattle from MCF. Working with colleagues from the USDA Animal and Plant Health Inspection Service’s National Veterinary Services Laboratories, the group plans to use a particular MCF virus strain present in hartebeest and topi (African antelopes) that does grow in culture. Veterinary medical officer Naomi Taus examines an MCF virus-infected epithelial cell in a sheep lung. The red area is the virus, and the green area is the cell. Another ruminant disease being investigated by scientists at ADRU is ovine progressive pneumonia virus (OPPV), which causes mastitis, respiratory distress, swelling of the knees (arthritis), and wasting in infected sheep. One in two U.S. sheep of open-range flocks are infected with OPPV, and it is believed to be mainly transmitted between adult sheep through respiratory secretions. OPPV slowly erodes producers’ profits over the years by lowering average weaning weights of lambs and the average number of lambs produced. 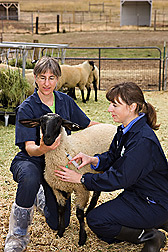 Animal care manager Emma Karel (left) and microbiologist Lynn Herrmann-Hoesing collect a blood sample from a sheep for an OPPV-related immunogenetic analysis. Herrmann-Hoesing and geneticist Stephen White, in close collaboration with Michelle Mousel and Gregory Lewis of ARS’s U.S. Sheep Experiment Station in Dubois, Idaho, are evaluating two different tests: One is a quantitative PCR test using real-time technology, and the second is an immunogenetics test. Diagnostic testing of sheep can be expensive since current recommendations are to test annually or biannually for at least 5 years to ensure OPPV-negative flock status. Animal diseases are a fact of life for livestock producers, but with improved diagnostic and therapeutic tools being investigated by ARS scientists, the well-being of food animals can be better managed and economic risks for the producers can be limited.—By Sharon Durham, Agricultural Research Service Information Staff. 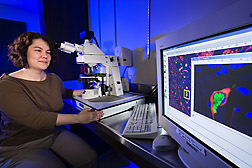 This research is part of Food Animal Production (#101) and Animal Health (#103), two ARS national programs described at www.nps.ars.usda.gov. Hong Li and Lynn Herrmann-Hoesing are in the USDA-ARS Animal Diseases Research Unit, 305 Bustard Hall, Washington State University, Pullman, WA 99164-6630; (509) 335-6002 [Li], (509) 335-6068 [Herrmann-Hoesing]. "Figuring Out Puzzling Animal Diseases" was published in the April 2010 issue of Agricultural Research magazine.